What the Heck Is In Those Bags? 1) since we share this bag between three midwives, midwives with different habits and histories, we endeavor to keep it simple and streamlined so that it works for everyone. Assistants and nurses also get in to the bag, so it has to be pretty simple. 2) the idea is that this bag is ready to go for two births, and two births only. In my experience, midwives run in to a lot of trouble overstocking bags. Items expire, things get lost, and you can’t find the thing you need. Ideally, immediately after a birth, you re-stock it. These pictures were taken a couple days after a birth. 3) We have all home birth clients order this birth kit. The kits have a lot of stuff that we use at every birth (and plenty of leftovers as most of our clients know). 4) We have standing orders in every chart and nurses to administer meds. More on that in the meds bag section. This is pretty much it. The large purple home birth bag, the small meds bag, a personal bag (this one is mine - Adrianna and Marinda have witchy baskets - and the postpartum bag. Not pictured: sump pump and antibiotic kit. 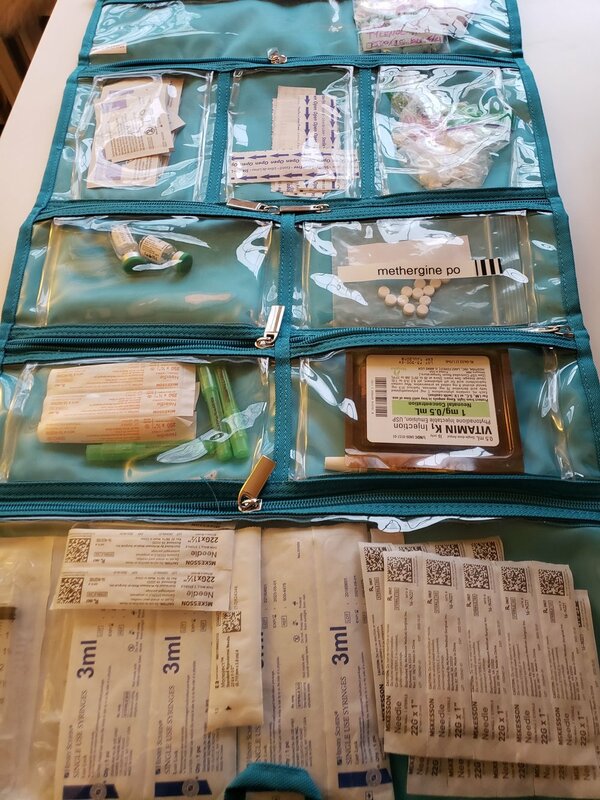 The meds bag is separate so that it can easily come inside and never lives in a car even for a few hours. The personal bag holds midwife gear like a computer, change of clothes, toothbrush, chargers, midwifery stuff used by that particular midwife only, etc. Finally, we toss the postpartum bag in the car, usually, because it has some things we don’t have duplicates of like a Massimo pulse oximeter we use for CCHD screening and newborn resuscitation. If anyone out there feels the call to buy us a duplicate, we would not say no! 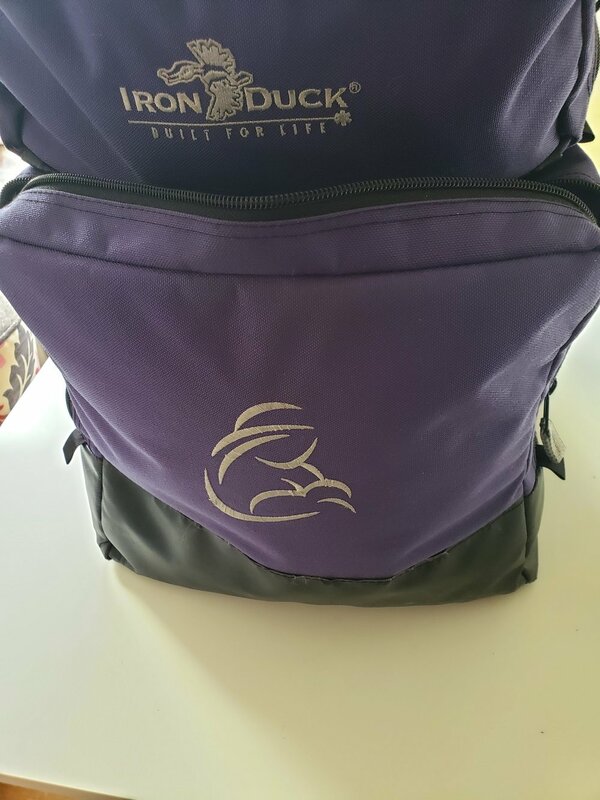 This is the Main bag, an Iron Duck medical bag made especially for midwives. The top pocket has a ziplock bag that, say, we arrive at a birth and the baby is coming, we could dump out on a chux pad and have pretty much everything we need. At every birth we assemble a bowl or tray for our use. From the “go bag” bag we take out the BP cuff, stethoscope, doppler, gel, flashlight, OB pack and thermometer. The rest of the supplies we put in our bowl come from your birth kit. Sometimes we will use the items in the “go bag” at a birth and then replace them with items from your kit. The items we take out get sanitized after a birth before they go back in the bag. The OB pack instruments go back to the birth center to be sterilized. The goal is to keep everything clean, new and in-dates, ready to go. please excuse the picture quality change. I came back to the inventory later in the evening so the light is not as good. The outside bottom pocket is where we keep big, bulky items that we frequently use. 2) non-sterile gloves - there are about 50 of these in every birth kit, but sometimes we need more. 5) Extra gauze and sterile gloves. It feels like there are births where we use none of these items and births where we use everything in your birth kit, plus our extras and start raiding the postpartum bag. 1) Draw supplies - needles, bandaids, alcohol, etc. 4) and 5) - supplies for labs like urine cultures, glucose, blood type, CBC etc. In my previous partnership in St. Louis, I was always the midwife who sutured, and I enjoy doing it when it is necessary. Over the years I have pared down the suture kit quite a lot, so that it is simple, streamlined and works perfectly, even when I am tired. 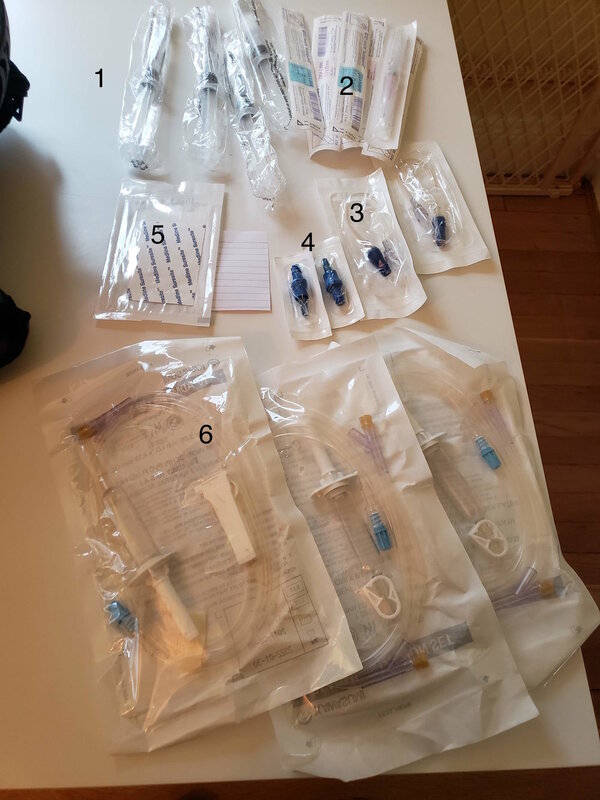 This is a basic kit to start an IV. Again, we like to keep it simple so that this bag can be grabbed and, without a lot of thought, an IV can get started. Simplicity is even more important since we have nurses from different situations and everyone is used to different equipment. This is a bunch of extra IV stuff. Not too much, nothing is more irritating than overstocked bags. Under all of the bags and pouches are other compartments where we keep less medical items. I think every home birth midwife has a cutting board in her bag. This is ostensibly for resuscitation, and we set it up at every single birth. Over several hundred births, however, we have only used it once. Maybe twice. Meaning, resuscitation is usually brief and in the parent’s arms. But we have it, and it is set up with the heating pad and warm towels so that it is ready when the baby is born. At the birth center we have a Resus-A-Cradle. These are the things typically used for newborn resuscitation. Everyone at every birth is certified in NRP, though it is rare for low-risk newborns to need more than a couple inflation breaths at birth. We check and assemble items here when we set up for a birth. We make sure the bags and masks are working properly, and check to make sure other emergency items are available. this tank will deliver oxygen for an hour. If we are at a rural location we can bring an extra tank. That almost concludes the birth-bag tour. There are some additional odds and ends under the oxygen equipment, including some rarely used emergency supplies and rarely used instruments. The outer back pocket has a file folder with actual paper in it. If clients do not have internet, or our computers die, we have back-up charts in here. We also have some diagrams and flowcharts that can be helpful at certain births. Meds laws are funny in Virginia. With the support of physicians and CNMs, we have standing orders for all meds for every client in every chart. We have a nurse available for every birth to administer meds. We hope these laws change sometime soon, as Virginia is unique in licensing midwives and not allowing them to administer the medications that are in our scope of practice. These are all relatively simple medications and are the standard of care in our community for every birth. The cornerstone of our practice is informed choice - we work hard to offer the standard of care as an option for everyone. Some of these medications are lifesaving and we believe that it would be unethical to attend births without them. There are some extras in this bag that I suppose we might occasionally use. But mostly we carry this so that the Massimo lives in one place. We take it out and have it with our resuscitation equipment. It goes back in the back for the CCHD screening at the first postpartum visit. And that concludes the tour of our birth bags. If you are a client, student midwife or a doula, we hope this was helpful - now the heavy purple bag is a little less of a mystery. Let us know in comments if you have any questions!